Kinesio Tex Gold Tape FP BLUE W/R 2" x 16.4' Roll, wave pattern. The "FP" stands for Finger Print. 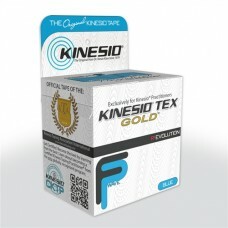 Kinesio USA re-designed the Original Kinesio Tex Gold Tape to improve performance. The tape should adhere for three to five days when properly applied. Also known as Kinesio Tex Gold FP. NEW Packaging! *Fast International Shipping Available.